Condominium Insurance Quotes, Great Rates! If you have purchased a condo or co-op, the bank will require insurance to protect its investment in your home. You may, however, need more insurance to cover your personal items, liability or fees that may be charged to you regarding shared areas of the building like the lobby. This provides coverage for your personal possessions, structural improvements to your apartment and additional living expenses if you are the victim of fire, theft or other disaster listed in your policy. You also get liability protection. A "master policy" provided by the condo/co-op board. This covers the common areas you share with others in your building like the roof, basement, elevator, boiler and walkways for both liability and physical damage. 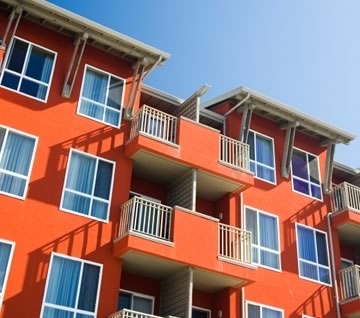 To adequately insure your apartment, it is important to know which structural parts of your home are covered by the condo/co-op association and which are not. You can do this by reading your association’s bylaws and/or proprietary lease. If you have questions, talk to your condo association, insurance professional or family attorney. Sometimes the association is responsible for insuring the individual condo or co-op units, as they were originally built, including standard fixtures. The individual owner, in this case, is only responsible for alterations to the original structure of the apartment, like remodeling the kitchen or bathtub. Sometimes this includes not only improvements you make, but those made by previous owners. In other situations, the condo/co-op association is responsible only for insuring the bare walls, floor and ceiling. The owner must insure kitchen cabinets, built-in appliances, plumbing, wiring, bathroom fixtures etc. This reimburses you for your share of an assessment charged to all unit owners as a result of a covered loss. For instance, if there is a fire in the lobby, all the unit owners are charged the cost of repairing the loss. This insures your property for damage by the back-up of sewers or drains. Water back-up may not always be included in a policy. Check to see that it is included. This is an inexpensive way to get more liability protection and broader coverage than is included in a standard condo/co-op policy. If you live in an area prone to these disasters, you will need to purchase seperate flood and earthquake policies. Flood insurance is available through FEMA's National Flood Insurance Program. Both flood and earthquake insurance can be purchased through your insurance agent. If you own expensive jewelry, furs or collectibles, you might consider getting additional coverage since there is generally a $1,000 to $2,000 limit for theft of jewelry on a standard policy. Let Bruce Hendry Insurance help you choose a policy that will fit your individual needs. Protecting your assets, whether personal, business, or both, is our goal. A well-chosen policy can lessen the impact of some of life’s most common, yet unforeseen perils. We’re here to help when you are considering Condo Insurance.